What Makes A Person “Tick”? Have you ever wondered why you think and act the way you do? Ever considered what makes a person “tick“? Each of us are are a blend of four personality traits, with one being dominate. Unfortunatley, most people never know their personality blend. More than 1,000 people have taken The Real You Personality Profile developed by Michael Stewart. There are many benefits of understanding your unique personality blend. The real strength of The Real You profile is the explanation of what it all means. Michael has an incredible understanding of the four personality types. He has spent more than 15 years teaching and coaching on the subject. Repeatedly, his conferences, workshops and retreats get Excellent to Wow ratings. In every setting, he begins with a thorough explanation of The Real You. Once team members have a solid grasp on every one’s personality traits they can cultivate better relationships. Better, healthier relationships reduce conflict. Once conflict is reduced, the workplace becomes a happier environment. Happy team members are more effective, efficient and productive! Once the team has an in-depth understanding of the personality types, Michael introduces Leadership and Excellence components. He has developed sessions on “How to Become a Successful Leader”, “Effective Teamwork” and “Next-Level Teamwork”. In two recent, yet very different settings, the results were the same. Both teams gave high praise to what they experienced and learned. Here’s what two leaders had to say. If you’re interested in learning more or inviting Michael to work with your team, contact him at michael@mstewart.org. http://mstewart.org/wp-content/uploads/2017/10/TRY-Pic.jpg 2376 1836 Michael Stewart http://mstewart.org/wp-content/uploads/2014/08/ms-s.png Michael Stewart2017-10-14 06:45:282017-10-15 05:28:33What Makes A Person "Tick"? For more than 30 years I have been an effective leader in the religious, non-profit and corporate arenas. I am the CEO (Chief Excellence Officer) of RMStewart Consulting. I help people become excellent, effective leaders. Churches and organizations use me as a speaker, conference leader and workshop presenter. I appreciate Michael’s approach as he comes alongside a pastor to assist the work already within the pastor’s heart. Michael’s approach goes to the heart of giving. Michael exhibited the highest integrity and character at all times, supplied Christ-like leadership in every aspect of our church, and put us back on track. It is my pleasure to recommend Mr. Michael Stewart and RMStewart Consulting. Mr. Stewart provided a Leadership Team Development event for our team. 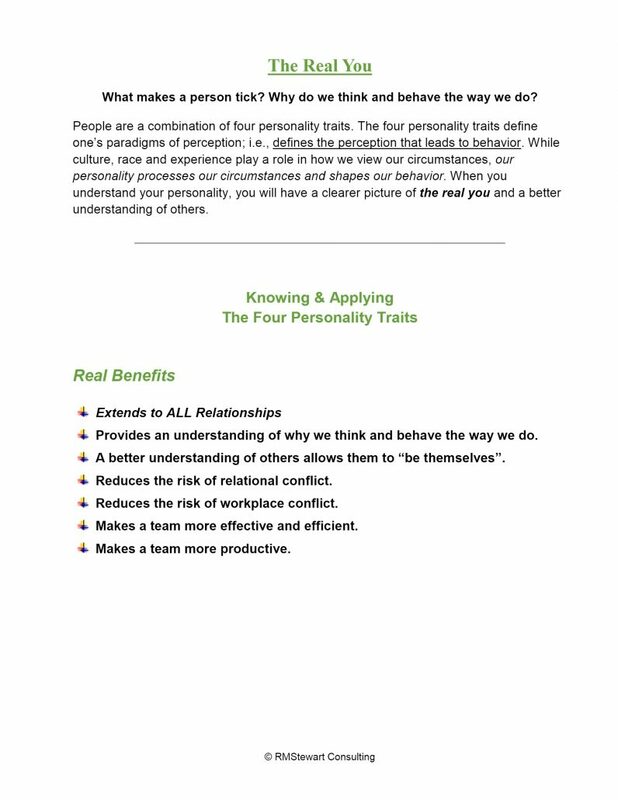 The Real You personality assessment tool and discussion of the four personality types was a topic of conversation many days following the training. It made our group more aware of the personality of their co-workers and seems to have reduced conflict and increased communication. We will use Mr. Stewart in the future to continue our progress toward the best school system we can be. Michael's The Real You personality inventory and leadership presentation helped us learn much more about ourselves and how to communicate more effectively as a team. His presentation on “Next-Level Teamwork” was invaluable for a church leadership retreat. I highly recommend RMStewart Consulting for your team or leadership development event. Leadership Retreat at The Circle Church A Sad Day of Irony or A Sweet Day of Life?